The Volumetrics wizard extends the existing volumetric calculations beyond what is available in the Geometry tab of the Map View. With the wizard, you can calculate the volume of a structure defined by just a top (single) or a top plus a base (dual), and a flat contact. Besides that, the total area of the contact as it intersects with the volume can be calculated and displayed in the Volumetrics output. This is especially useful for users of GEOEX volumetrics or any package utilising area/depth to define unusual (non log-linear) volume distributions. Click on Volumetrics to open the wizard. Depending on the type of structure, the volumetric calculations will be different. 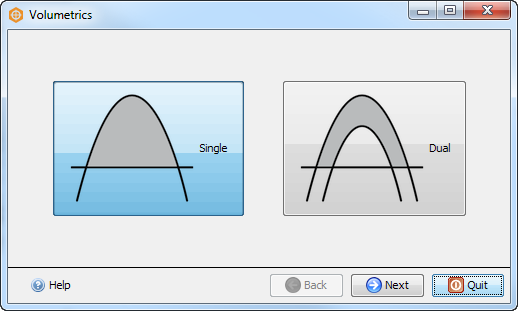 Click on Single to calculate the volume of a structure between a top and a flat contact. Click on Dual to calculate the volume of a structure between top and base, and a flat contact.